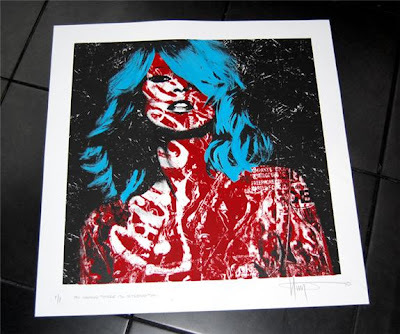 Street artist K-Guy has dropped us an email to let us know he has hooked up with The Brooklynite Gallery in New York and produced a special 1 off, hand finished version of his Coke Moss screen print (pictured above) to auction for the HAITI Relief fund. It's been hand inked in blue to echo Haiti's Flag colours with the words 'In union there is strength' written along the bottom which is Haiti's motto and also appears on the flag. - Size: 700mm x 700mm - Signed, blind stamped and numbered and will be supplied with full, signed COA. K- Guy will be donating 100% of the winning bid to CHANCES 4 CHILDREN for the Haiti Renewal Fund and Earthquake Relief. Please bid generously, this is a great chance to obtain a one off Coke Moss and help a much deserving cause. 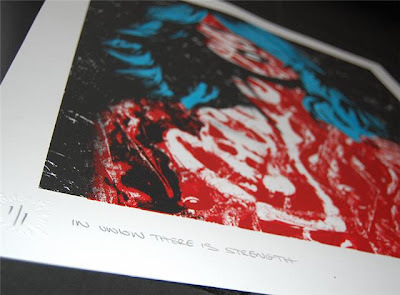 The screenprint is now up on Ebay now and you can place your bids on the item here.